چارلز دنس (اینگیلیسجه: Charles Dance) بریتانیالی فیلمین سناریو یازاری, فیلم یؤنئتمنی و اوْیونچو. 1971–گۆنوموز ایللر آراسیندا سینما ساحه‌سینده چالیشیب. 2003 Cox William Rod On, Jr.
1974 Commandant Neil O'Brien ITV Episode: "The Secret Garden"
1983 Parker LWT Episode: "The Ojuka Situation"
2002 Guy Spencer ITV Episode: "The White Feather"
2005 Sir Henry Somerset BBC Episode: "Close Quarters"
2006 Septimus Bligh ITV Episode: "By the Pricking of My Thumbs"
2009 Aredian BBC Episode: "The Witchfinder"
2011 Dr. Richard Fludd Syfy Episode: "Part 1"
↑ N'Duka, Amanda (May 18, 2017). 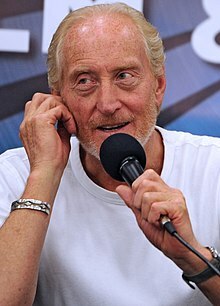 "‘Game Of Thrones’ Alum Charles Dance Joins ‘Godzilla: King Of The Monsters’". Deadline Hollywood. Archived from the original on May 18, 2017. Retrieved May 18, 2017. ↑ Game of Thrones: Cast. HBO. آرشیولنیب اصلی نۆسخه‌دن on September 1, 2016. یوْخلانیلیبMay 18, 2017. ↑ 'Game of Thrones' actor to star in major Syfy miniseries. Entertainment Weekly's EW.com. ↑ The Witcher – News. CD Projekt Red. ↑ Game of Thrones, Metal Gear Stars among Call of Duty: Black Ops 4's Zombies Mode Cast (12 December 2018). یوْخلانیلیب13 December 2018. ↑ Black Ops 4's new Zombies mode stars Kiefer Sutherland, Helena Bonham Carter (13 December 2018). یوْخلانیلیب11 December 2018. ↑ The Fourth Protocol. Dh Audio (1985). اینگیلیسجه ویکی‌پدیاسی‌نین ایشلدنلری طرفیندن یارانمیش«Charles Dance»، مقاله‌سیندن گؤتورولوبدور. ( ۲۲ ژانویه ۲۰۱۸ تاریخینده یوْخلانیلیبدیر). قارداش پروژه‌لرده چارلز دنس گؤره داها آرتیق بیلگی‌لر تاپابیلرسینیز.